Examining what is involved in learning to write for academic purposes from a variety of perspectives, this book focuses in particular on issues related to academic writing instruction in diverse contexts, both geographical and disciplinary. 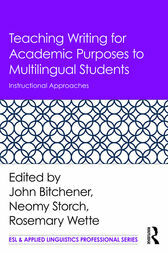 Informed by current theory and research, leading experts in the field explain and illustrate instructional programs, tasks, and activities that help L2/multilingual writers develop knowledge of different genres, disciplinary expectations, and expertise in applying what they have learned in both educational and professional contexts. "The contents page of this book reads like a who’s who of the field of second language writing….This book would be suitable for anyone teaching academic writing." John Bitchener is Professor of Applied Linguistics at the Auckland University of Technology, New Zealand. Neomy Storch is Associate Professor in ESL and Applied Linguistics at the University of Melbourne, Australia. Rosemary Wette is a senior lecturer in Applied Language Studies at the University of Auckland, New Zealand.